2. pH homeostasis in organelles. This virtual lab is designed to allow you to experience the scientific way of thinking by studying mechanisms underlying the digestion process performed by Paramecium. 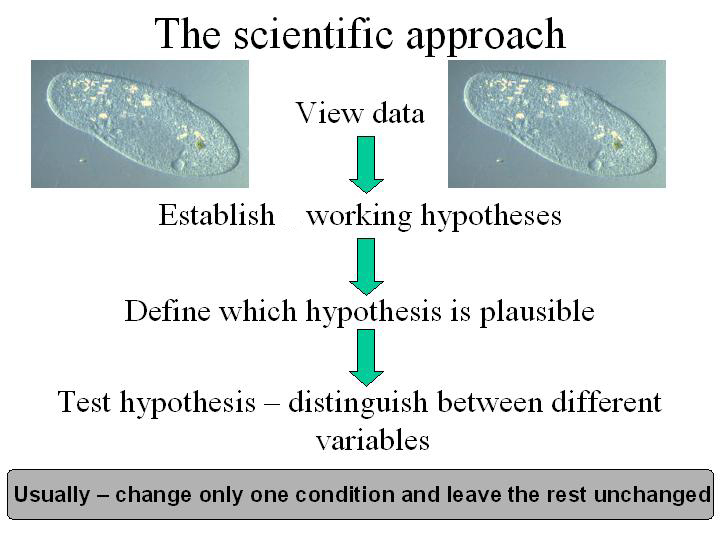 The process you are about to explore takes place in paramecium, BUT we have simplified it. In real life, the mechanisms underlying the events discussed below are far more complicated. Please use the Morfix on-line dictionary. Introduction Part A: Why did we choose Paramecium as a "model system"? Eukaryotic cells are incredibly complex machines. They contain many different subcellular compartments, each of which fulfills a different role. These compartments are dynamic - moving, merging then separating all the time. In addition, the biochemical composition of these compartments also changes - proteins are degraded, pH is changed, etc. In order to begin to understand such complex processes we need to choose a simple model system. 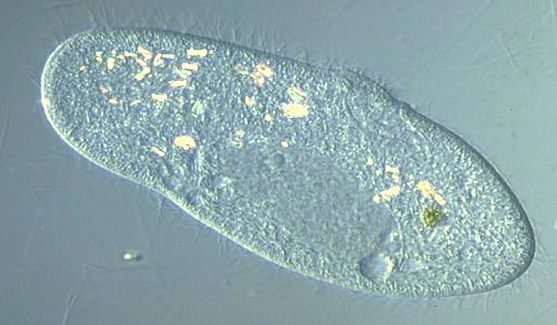 The protist Paramecium caudatum (to the right), a unicellular eukaryotic organism, provides us with such a model. It is easy to grow in large numbers and has been studied extensively for over 200 years. Due to its relatively large size, it can be studied easily using light microscopy. The process of intracellular digestion has been previously described in this organism. We will use this well characterized process to analyze the subcellular events taking place in the food vacuole (stained here in red). Part B: How do scientists conduct their research? When a scientific question is being studied, the scientist needs to view the data he has and use them in order to formulate several working hypotheses. He then attempts to evaluate which hypothesis is more plausible and/or which hypothesis can be tested easily. He then plans specific experiments which allow him to confirm or negate the different possibilities he has raised. This in turn is used in order to refine his hypothesis and plan new experiments. This approach is described in the scheme below. This is exactly what YOU will be doing in this tutorial. During each step of the tutorial you will be provided with multiple-choice questions. The different answers will lead you to additional comments and explanations. so don’t rush through the tutorial. Take your time - examine ALL possibilities during each step.